Crude oil prices hit a four-year high as U.S. sanctions on Iranian crude exports loom and OPEC and Russia decline to raise output. Oil futures eased off session highs after U.S. President Donald Trump called on OPEC to increase crude output. Trump also said the United States will put more sanctions on Iran following oil sanctions in November. Oil prices rose on Tuesday but eased off a four-year high after U.S. President Donald Trump called on OPEC to increase crude output, even he as called for heavier sanctions on major oil producer Iran. 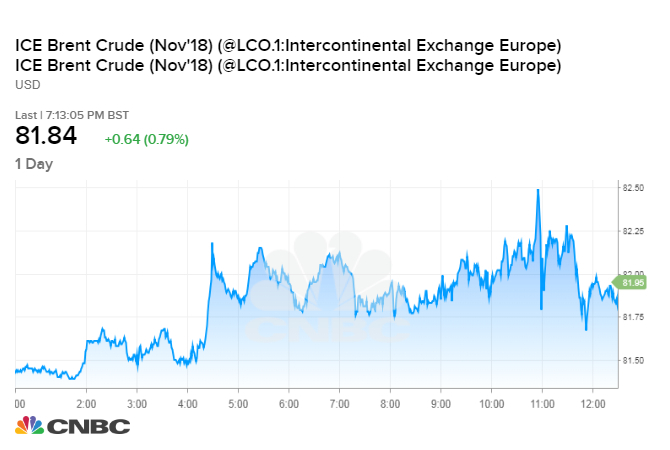 Prior to Trump's remarks, oil had headed higher, with Brent hitting $82.55 per barrel, its highest since Nov. 10, 2014, on concerns about global supply shortages in the wake of U.S. sanctions on Iran's oil exports, which go into effect Nov. 4. Brent crude futures were up 70 cents, or nearly 1 percent, at $81.90 a barrel by 2:26 p.m. ET. U.S. West Texas Intermediate crude futures were up 16 cents at $72.24 a barrel, close to their highest since mid-July. The global benchmark Brent is on course for its fifth consecutive quarterly increase, the longest stretch of gains since early 2007, when a six-quarter run led to a record high of $147.50 a barrel. Trump reiterated calls on the Organization of the Petroleum Exporting Countries to pump more oil and stop raising prices in a speech before the United Nations. The so-called "OPEC+" group, which includes the likes of Russia, Oman and Kazakhstan, had met at the weekend to discuss a possible increase in crude output, but the upshot of the gathering was that the group was in no rush to do so. Mohammad Barkindo, OPEC secretary general, said in Madrid on Tuesday that it is important for OPEC and its partners to cooperate to ensure they do not "fall from one crisis to another." "It's hard to believe that the Saudis won't answer the call at some point, especially if prices tick much higher," said John Kilduff, a partner at Again Capital in New York. "He's going to be unrelenting in pressuring them." Trump also said in his speech that the United States will put more sanctions on Iran following oil sanctions in November. The sanctions are expected to have an immediate impact on OPEC's third largest producer's exports. "Iran will lose sizeable export volumes, and given OPEC+ reluctance to raise output, the market is ill-equipped to fill the supply gap," Harry Tchilinguirian, global head of commodity markets strategy at French bank BNP Paribas, told the Reuters Global Oil Forum. Most of the potential supply shortfall has already been priced into the contract, Again Capital's Kilduff said. Speculative length has already piled into the contract, he said. While Britain, China, France, Germany, Russia and Iran on Tuesday said they were determined to develop payment mechanisms to continue trading despite the sanctions by the United States, most analysts expect Washington's actions to knock between 1 million and 1.5 million barrels per day (bpd) of crude oil supplies out of markets. "We view Brent's rally above $80 per barrel as fundamentally justified," said Fitch Solutions in a note. The International Energy Agency forecast strong oil demand growth of 1.4 million barrels per day (bpd) this year and 1.5 million bpd in 2019, and said in its most recent report that the market was tightening.